FSI SID&GP | Drugs marking – risk mitigation fee? Front page » News » 2019 » Drugs marking – risk mitigation fee? Drugs marking – risk mitigation fee? Minpromtorg of Russia and SID & GP held an extended session of the marking working group at the International Economic Forum of CIS Member States «CIS: Digital Economy – Integration Platform». The status of manufacturers and regions readiness for drugs marking, including the 12 high-cost nosologies, as well as the understanding by the industry that marking is inevitable and the cases of the «pioneers» engaged in printing and aggregation of marking codes – all these topics were discussed today during a 3-hour meeting of the key players at the domestic pharmaceutical market. 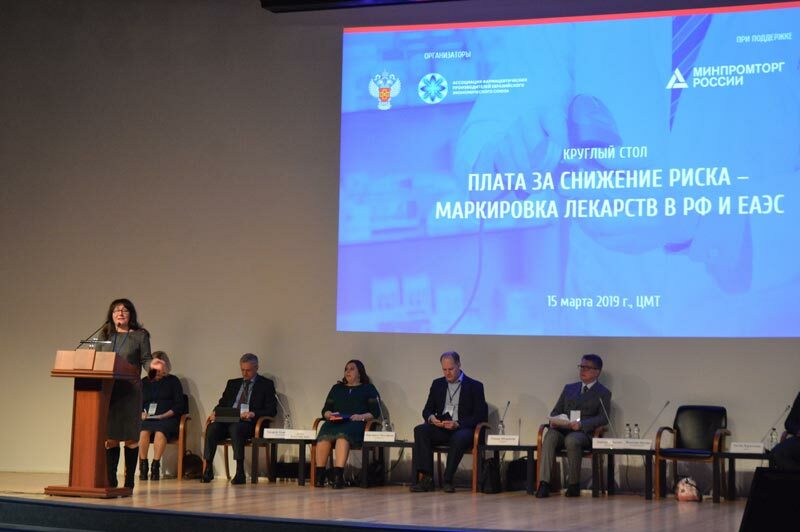 «Marking is inevitable,» was the thesis of the Deputy Head of the Federal Service for Surveillance in Healthcare Valentina Kosenko who opened the round table «Risk mitigation costs – marking of drugs in the RF and the EAEU» which attracted about 300 pharmaceutical companies. It became the key message of the current discussions on the issues of marking implementation in Russia. As of today, as reported by the co-organizer of the event, SID & GP, within the territory of Russia, there are 530 registered manufacturers of drugs with 726 manufacturing sites. With that, 145 companies are registered as manufacturers of medical gases, towards which there is no technical regulation on marking. So, such sites are not subject to analysis. As of 14 March, the analysis of 288 manufacturing sites (561 packaging lines) releasing drug products demonstrated that more than 60% of manufacturing sites in Russia are still not ready for implementation of the drugs marking system: manufacturers responded that for 138 lines contracts had not yet been initiated, and for 196 lines negotiations with vendors were still ongoing. At the same time, at 62 manufacturing lines, the equipment and software are being tested. The lines tested are capable of packing about 234 INNs (160 INNs from the List of Vital and Essential Drugs – in total, in Russia, there are 2,800 INNs and 735 INNs in the List of Vital and Essential Drugs). 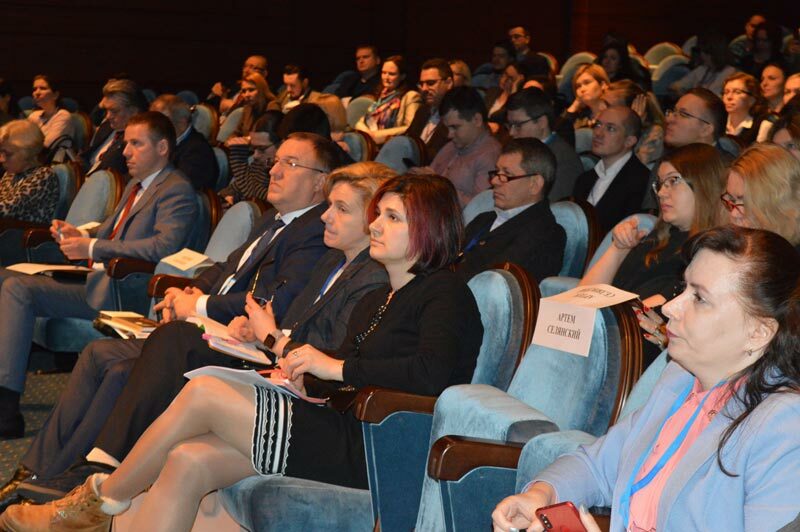 Almost one third of foreign and Russian drug manufacturers for 12 high-cost nosologies («12 HCNs») still remains unconnected to the system, although, as it was reminded by Valentina Kosenko, starting from 01 October, 2019, circulation participants for 7 HCNs will have to upload the information about drugs and all operations with them to the system of drugs movement monitoring based on marking. As reported by Prospective Technologies Development Center the monitoring of which was referenced in the report by Margarita Mustafina from Novartis, 21 out of 47 Russian sites are actively engaged in marking of their drugs. In terms of foreign sites, the figures are 18 out of 78. «On the whole, 53 sites have the equipment which is necessary for application of control and identification codes. At 34 sites, process testing is ongoing,» emphasized the speaker. It’s worth noting that Russian sites manufacture 25 out of 33 INNs under the «7 HCNs» program. As for the marking of drugs from the low-price segment (below RUB 20), the majority of manufacturers is on the step of equipment selection, and readiness for drugs marking of various levels is demonstrated for 16 INNs only. At the same time, manufacturers of high-price segment (12 HCNs, oncology and HIV) are actively implementing the marking system.